How much does it cost to use Sharesies, and what does it get you? All new Sharesies investors get the first month of their subscription for free. After the first month, you can choose between an annual subscription or a monthly subscription. A Kids Account is half the price of an adult subscription. Find out more here. 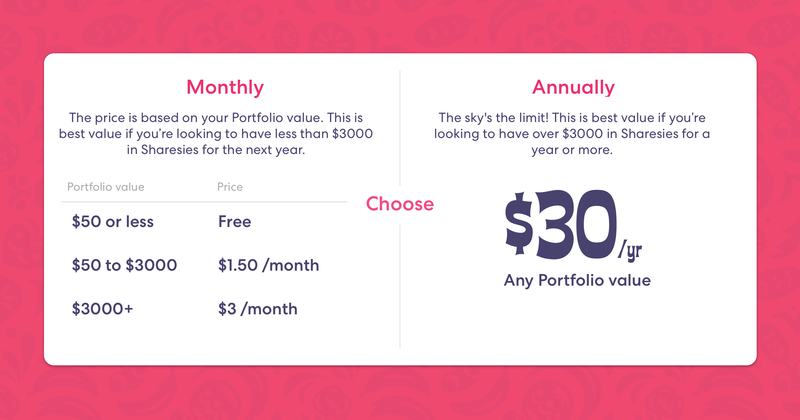 If you choose an annual subscription, you pay $30 per year (no matter what your Portfolio value is). Anyone can choose an annual subscription. If you choose a monthly subscription, you pay a subscription fee based on your Portfolio value (the total value of the investments you own plus the amount in your Sharesies Wallet) on your renewal date. For example, if your subscription renewal date is on the 2nd July, your fee is based on your Portfolio value on 2nd July. You can choose between an annual subscription or a monthly subscription. You can choose to pay your subscription fee with a card (debit/credit) or from your Sharesies Wallet. More info about subscriptions can be found here. Any management fees are charged by the fund manager, not Sharesies, and are included in the unit price.